At 16" in diameter by 9.25" in height, your pendant lamp will not easily go unnoticed. The lamp shade has a flexible, smooth plastic interior with a choice of polyester or linen exterior. This polyester version is the more affordable of the two, while still maintaining a simple elegance. The shade is finished with white, polyester ribbons lining the top and bottom. The lamp shade comes with a cord that is easily strung up and has a convenient on/ off switch attached. Fits a 60 or 13 watt light bulb (light bulb not included). To clean, simply use a damp cloth. Calling all children who would rather be at the beach than at school! 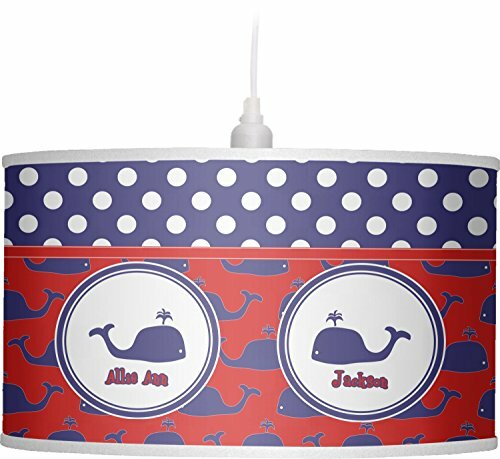 This nautical design, featuring polka dots and whales in All-American classic red, white, and blue, is perfect for you. There are two labels to customize by adding your little sailors' names.